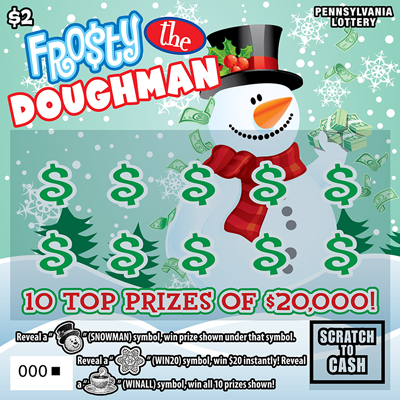 Frosty the Doughman is a $2 game that offers 10 top prizes of $20,000 and features enhanced printing for the holiday season. Reveal a "SNOWMAN" (SNOWMAN) symbol, win prize shown under that symbol. 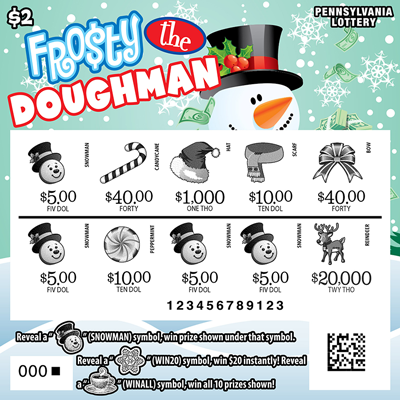 Reveal a "SNOWFLAKE" (WIN20) symbol, win $20 instantly! Reveal a "HOT COCOA" (WINALL) symbol, win all 10 prizes shown!